Robinsons is promoting squash made from natural fruit ingredients in “Birdhouse,” a television commercial starring a bird living in a miniature home. The bird returns home to check out the television news delivered by a pigeon, before checking out the fridge for a package of worms and two bottles of Robinsons fruit juice. A human cuckoo announces the time. 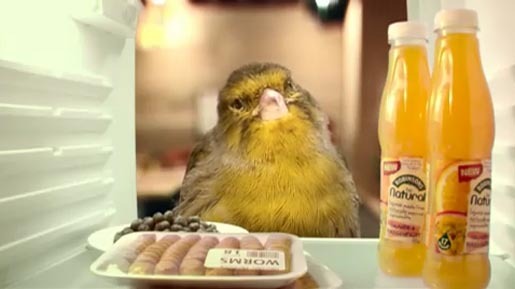 The Robinsons Birdhouse ad was developed at BBH, London, by creative director Nick Gill, creatives Matt Waller and Dave Monk, agency producer Ben Davies. Filming was shot by director Andy McLeod via Rattling Stick, London, with producer Kirsty Dye and director of photography Stuart Graham. Editor was Andy McGraw at Cut + Run, London. Post production was done at Big Buoy by Jim Allen.